The mainsail is the most importent sail in every boats sailinventory. We put a lot of efforts in designing and producing a sail that fits every single sailors personal prioritys and needs, in aspects of handling, performance and price. The mainsail is the important back of the whole sail- / wing profile and need to be a perfect max to the headsail configuration. Our experience and knowledge regarding mainsail design goes back to mid -70 and we offer optimized design that match rig type, the characteristic of the boat and manufacture a sail that will fulfil the needs regarding performance, durability. A mix all together with personnel needs and price. This panel layout is manly used with woven fabrics. The construction is recommended when durability is set to a first priority and suitable for small to mid size range of boats. Manufactured in many different woven constructions but also in multi-directional laminates when fullradial layout is not recommended. This panel layout is the choice when the demand is set for a stable shape and high performance. 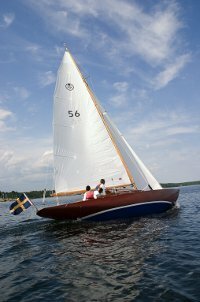 Suitable both for racing sails as well as performance cruising. Manufactured in high quality fabric with different type of constructions and fibres options that range from polyester to carbon. This is the no.1 choice and the ultimate in construction for racing and performance sails is the D4 Load Path Technology. D4 features yarn trajectories that not only address loads from the corner but also those concentrating at reef points. D4 offers the largest choice of fibres, including Kevlar, Spectra, Vectran and Carbon all combined to make a membrane with lowest stretch available at the market. All mainsails come with different options. Like number of battens and length, reef positions, slides and track etc. Speak to your Hamel Sails consult to perfect your sail according to type of rig / mast and your personal demands.